Resources and Locations in the Private Investigation!!! There are a lot of “people finder” websites and most are not worth investing any money in while doing a criminal background. With internet search engines, social networking, or calling the County Assessor’s sites, you will get just as much information going this route as you will by paying the “Instant People Search” websites. Save your money but won’t have the resources that a private investigator would have, yes you might save money! But, is your safety for a loved one is worth a few bucks in doing just to save money! No. so contact us today. The private investigator or FBI” information bureaus that we have rights to are not those that the general public can access. We had to go through a very in-depth screening process, meet strict criteria, and hold verifiable-good standing credentials in the law enforcement and investigative industry. These databases that we use contain information not open to the general public. We are subject to audit through the GLBA, DPPA, FDPP, REBOC, UCC, FCRA, Social Security Administration, Department of Homeland Security, and other regulatory agencies. We are able access the limited “public record” only accessible under very strict guidelines. Our nationwide database allows us to access information from most government agencies and other proven resources more efficiently, with information returned the same day. Searches can be done with very little information and we are one of only a few that can search with only a Date of Birth or partial Date of Birth. d. – Phone numbers that are unlisted, unpublished, cell phones, historical, name, address. Metro Intelligence Agency, is a full Private Investigation agency which is based in Denver, but provides private investigators across Colorado and Nationwide. Our databases and networking allows access to nationwide information from most government agencies and other proven resources more efficiently. In many cases information can be returned the same day! We know investigative matters often involve highly charged, private situations and require discretion. We are sensitive to this and know how to minimize the stress in handling matters of a delicate nature. 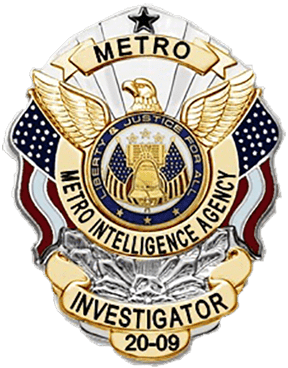 Metro Intelligence Agency is ready to get to work for you to ensure your quest for knowledge is met and give your the peace of mind you deserve. Our private investigator professionals are ready to speak to you for a free consultation at (720) 443-3382. Investigations is not about knowing everything – it’s about knowing how to find the answers and having the right resources available!